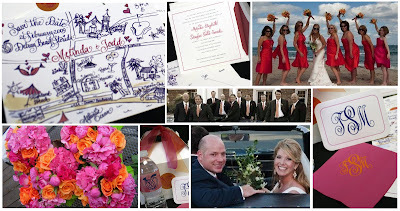 Melinda and Todd's destination wedding in Florida was a fabulous combination of preppy but bold colors. Held at the Gulf Stream Bath & Tennis Club, the reception was dotted with bright colors. Juicy orange and passionate pink popped in the bouquets, on the beverage napkins, and on the labels accenting the favors. Special touches were incorporated throughout the entire planning process. 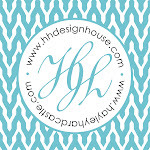 The navy and pink invitation had a custom pink liner and the groom's brother designed the logo used by HH Design House on many of the custom products. This meaningful logo was a perfect symbol of the uniting couple with interlocking rings incorporating a golf tee and a Georgia peach. The couple topped off this brilliant and colorful wedding by honeymooning on a tropical island. Best Wishes for a bright and happy future!